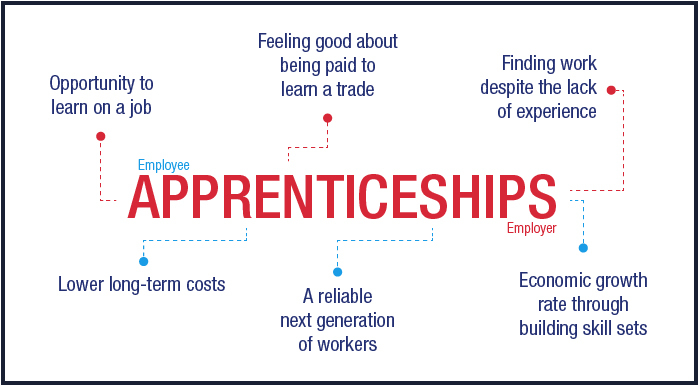 What are the benefits of apprenticeships? Apprenticeships are a well-established historical tradition in the UK, and they are practiced throughout the world in various formats. Once only associated with trades such as carpentry, schemes are appearing in many other areas following on from revitalization in the 1990s (source: Parliament Publications). Since then, it has been more recognized that these types of schemes are beneficial for individuals and even the economy itself (source: NAO). With trends set the way they are, we are bound to see even more apprenticeships utilized by employers. So what is so great about them? Predominantly, an apprenticeship is an opportunity to learn hands-on, and therefore to learn from the grass roots up. With the economy in its current state of depression, unemployment has risen to 2.52 million. There are many cases of people who are more than sufficiently educated, but lack the previous experience required for certain jobs, and are therefore rejected. Apprenticeships offer an answer to this common problem; employees can take on positions with no previous experience required. All that is required is a willingness to apply energy and enthusiasm to engage in new skills. Apprenticeships also allow employers to adopt employees in a ‘blank state’ and teach them according to their own principles. This is an essential process since the external job market may not offer people with skill sets that are as specific as certain businesses require. Also, this works out cheaper for the employer as induction and recruitment costs would not be factors. Finally, there is the feel-good factor. Employees will be paid to learn, which will keep confidence high, and there is arguably no better way to learn a trade than to be taught by those who are already masters of it. Recently, Mayor Boris Johnson has been working to create tens of thousands of apprenticeships, famously in the food and hospitality businesses with Raymond Blanc. The Mayor has said, “it is absolutely fantastic to have someone of Raymond’s calibre spearheading our drive to help the food industry wake up to the power of apprenticeships.” This kind of development has garnered much-needed PR, and the Mayor’s efforts have shown in the rising figures by the National Apprenticeship Service. The Mayor of London’s marketing campaign is well underway with National Apprenticeship Week having just passed, and businesses are slowly but surely discovering the benefits these schemes have. So, is an apprenticeship beneficial? Whether it is or isn’t, he long tradition, it seems, is not going to die out any time soon. ← Is Social Media Working To Find Me A Job?